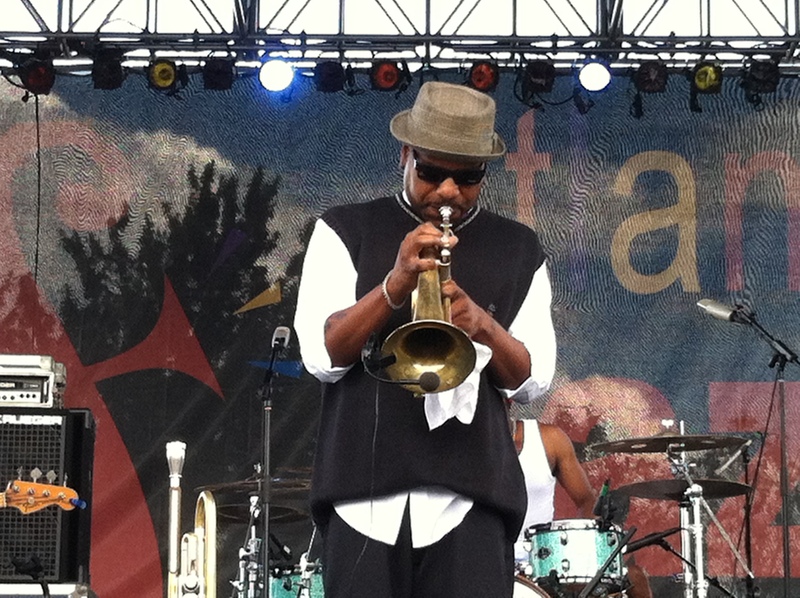 It’s confession time…When I last attended the Atlanta Jazz Festival in 2012, most of the truly memorable musical moments I experienced were not at the Main Stage but at the smaller and more intimate International Stage. Like the Main Stage, the International Stage features world-class musicians but the setting makes all the difference. You are much closer to the musicians, those in the audience are there for the music, not a party and the artists are happy to reward the patrons for their respect and attention. In years past, the International Stage had featured a mix of artists from outside the U.S. and groups that hailed from the Atlanta area. However with the advent of the Locals Stage this year, the lineup at the International Stage has taken on a true World Music feel, featuring the most culturally diverse group that I’ve ever seen at the AJF. I admit that I will be torn at times between a “name” artist on the Main Stage and an up and comer that I am fond of on the International Stage. Unless cloning is perfected within the next week, I’m likely to make the decision spontaneously. Scott Fugate, I hope that you’re up for a few of those “harrowing golf cart rides”! 3:30 pm: Somi – Born in Illinois to parents from Rwanda and Uganda, this vocalist brings a mix of African rhythms, jazz and soul that is as gorgeous and unique as anything I’ve heard on today’s musical scene. She has been called “a modern-day Miriam Makeba” by some with a sound that Vogue Magazine called “gorgeous”. He recorded work has been first-rate (my favorite is 2011’s Live at Jazz Standard) and we are looking forward to her upcoming major label debut The Lagos Music Salon, which will feature Common and Angelique Kidjo, with great anticipation. 5:30 pm: Eldar Trio – This young pianists stunning dexterity has drawn breathless comparisons to Oscar Peterson, Art Tatum and many other keyboard giants. Eldar Djangirov has been praised by legends such as Dr. Billy Taylor and Dave Brubeck, who called Eldar “a genius…”. Born in Russia and raised in Kansas City, the 27-year-old last year simultaneously released jazz (Breakthrough) and classical (Bach/Brahms/Prokofiev) albums to critical acclaim across the musical spectrum. If you plan on attending his performance, make sure that you bring a chair with a seat belt. 1:30 pm: Ali Amr – Ali Amr is a Moroccan singer and Qanun performer. The Qanun is a zither-like stringed instrument that is played throughout much of Asia, the Middle East and Southern Europe. Mr. Amr has always been musically curious and that curiosity has brought him and his Qanun into a variety of musical settings and genres, among them being jazz. He performed at the Newport Jazz Festival last year and we look forward to what he has brought south for us to hear in Atlanta. 3:30 pm: Diego Figueiredo – Diego Figueiredo is considered one of the most talented guitar players in the world today. He is the winner of several important competitions including the Montreux Jazz Competition and the VISA Prize. He has released twenty albums, three DVD’s, and several instructional books. His music is a fusion between Jazz, Bossa Nova and Classical. Diego has performed in over forty countries around the world. 5:30 pm: Cyrille Aimee – Winner of the Montreux Jazz Festival’s International Vocal Competition, the Sarah Vaughn International Jazz Vocal Competition and finalist in the Thelonious Monk Vocal Competition, French/Dominican vocalist Cyrille Aimée is, in the words of Will Friedwald of The Wall Street Journal, “one of the most promising jazz singers of her generation. ( A side note, I happen to agree with Mr. Friedwald, 100 percent.) Cyrille’s major label debut, It’s a Good Day, will be released this year but while your waiting, check out her Live at Smalls CD, featuring Roy Hargrove.